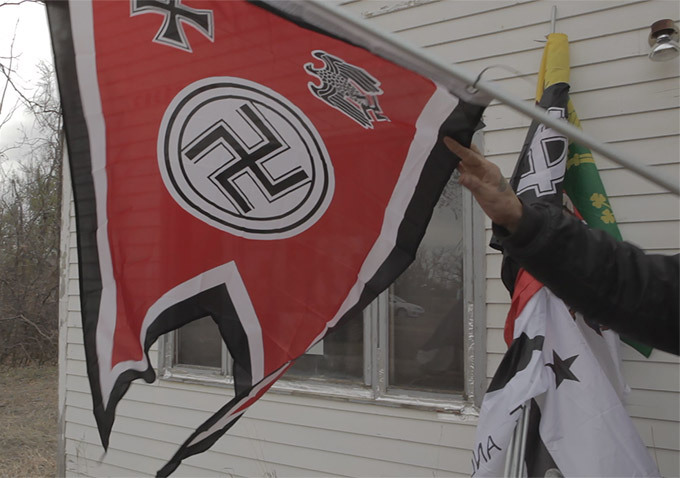 In 2012, longtime white supremacist leader Craig Cobb bought a property in Leith, North Dakota, a minuscule town that at the time counted 24 people as its population. That ominous development provides the starting point for “Welcome to Leith,” directors Michael Beach Nichols and Christopher K. Walker’s fascinating portrait of bigotry incarnate. The filmmakers deliver an up-close look at recurring showdowns between infuriated locals and the disturbing figure of Cobb, along with the various likeminded forces who sprang up to support him. Filled with gripping showdowns and sinister agendas, the movie builds its unsettling power by depicting the struggle from both perspectives. While the delineation between good and evil holds strong, “Welcome to Leith” is also creepily even-handed. The town’s ramshackle appearance — “b-roll from ‘The Walking Dead,'” as one journalist puts it — lends itself to the disturbing proceedings at hand. The vacant streets and creaky wooden homes convey the sense of abandonment that allows Cobb — a bearded lunatic who spouts his racial creed to untold followers online — to quickly take root. When he initially arrives, Cobb doesn’t stand out to any of the locals as particularly suspicious, until they notice his call to arms as he beckons various white supremacist leaders to join him in the area. Blending talking heads with snippets of news coverage, “Welcome to Leith” erupts into an intense second act as Cobb storms town hall meetings in an alarming, systematic process of provoking reactions from terrified locals. The outcry over Cobb’s presence in Leith quickly generates national attention — in addition to support for his right to live there from major white supremacist figures, some of whom head to the town to further their efforts. Hoping to attract a voting majority with the expressed desire of developing an Aryan outpost, Cobb’s mission is particularly troublesome because of the communal support that surrounds it, which the filmmakers capture in a suspenseful blend of verite and testimonials from both sides of the battle. While there’s a certain morally transgressive element in the movie’s use of traditional documentary technique to allow Dutton and Cobb to discuss their motives, it also deepens the movie’s illustrative power. As the men continue to threaten locals, who respond by constantly monitoring their assailants behavior, “Welcome to Leith” develops into a stunning portrait of First Amendment rights pushed to their extremes. Ultimately, both Dutton and Cobb were arrested for patrolling their neighborhood with guns, but that’s only the beginning of a story in which seemingly every response to their provocations feed into their horrifying intentions. At one point, Cobb appears on a talk show in a comedically misconceived bid to prove his “Aryan heritage” with a DNA test, only to discover that he has African ancestry. But while he laughs off the experience, his smile is deceptive: Even as the world mocks Cobb, it continues to provide him with a platform for his maniacal creed. “I’m the most famous racist in the world,” he shouts to one local heckler, and that’s exactly how he planned it. The filmmakers drive that point home in a haunting finale as they sit with Cobb in a hotel room away from the public eye. It’s here that he strikes a noticeable contrast with the rambling lunatic seen before. Was it all an act? Examining his angry protocol with a measured gaze, “Welcome to Leith” questions the notion of progress in a country where hatred has the power to percolate on its own terms. As menacing as Cobb sounds during his outbursts, he’s far more intimidating when he comes down to earth. “Welcome to Leith” premiered this week at the Sundance Film Festival. It is currently seeking U.S. distribution.